This week on #meetascientist we want to take time to introduce you to the creative and adventurous women behind The Cairn Project. We have teamed up with The Cairn Project to raise $20,000 to support girls in science and the outdoors. This is an ambitious project and we still have a long way to go, please consider contributing to this amazing cause. And in the meantime, get to know Alison and Sarah! Alison and Sarah, you met as undergraduate students at the University of Colorado. What brought you together back then and what keeps your friendship strong today? Alison: We met in a literature class at CU Boulder, and it’s funny, because now hiking is a central part of what we do together, but in Boulder it was more varied - music, coffee, other local stuff. Once Sarah moved to Missoula for her PhD program, we had to make more of an effort to keep the friendship strong. I think that’s when we hit our stride with planning amazing outdoor trips. At this point, our friendship consists of a lot of phone time and as many days in beautiful landscapes as we can piece together! Sarah: Actually, I think it was our mutual taste in shoes that spurred our friendship - we were both early adopters of the Blundstone boot trend. That was back in 2003, which seems crazy! Our friendship was pretty low key for the first couple of years, but we kicked it up a notch when we went on a two week trip to Tunisia. Our friendship has definitely evolved through a lot of growth and transitions we each have gone through in our lives - relationships, graduate school, relocating to new places. In a way, the low points of some of those transitions propelled our friendship forward. Where did the idea for The Cairn Project come from and what did it take for it to become a reality? Alison: The Cairn Project is my best example of the creative magic you can tap into on a girls’ hiking trip! In April 2015 we were in Utah, hiking and starting to plan our John Muir Trail thru-hike. I had come up from Mexico City and Sarah flew in from Minneapolis, so maybe the desert glory of Capitol Reef was extra inspiring? Over coffee one morning I made a joke about turning our JMT hike into a walk-a-thon, and the whole thing just evolved from that moment. We spent most of the rest of the trip hashing out and dreaming up the concept, and by the end of that week we had chosen a name and bought a website domain. In retrospect, it seems insane, but that’s how it started. Sarah: Both Alison and I were at a point in our careers where we were taking stock of what we wanted to invest our energy into. We realized that giving back was something we both felt passionate about. The Cairn Project has been a labor of love from the beginning, and it’s about to have a one-year birthday! It’s amazing to reflect on how much we’ve been able to accomplish in that amount of time. Since our public launch in July 2016, we’ve made $30K in grants to six different local groups across the country that are getting girls outside in Alaska, California, Colorado, Minnesota, and Montana. Last summer, you hiked the John Muir trail to launch The Cairn Project and spent 12 days in the backcountry, braving the at-times harsh conditions and high mileage days. What were the biggest challenges? What were the biggest rewards? 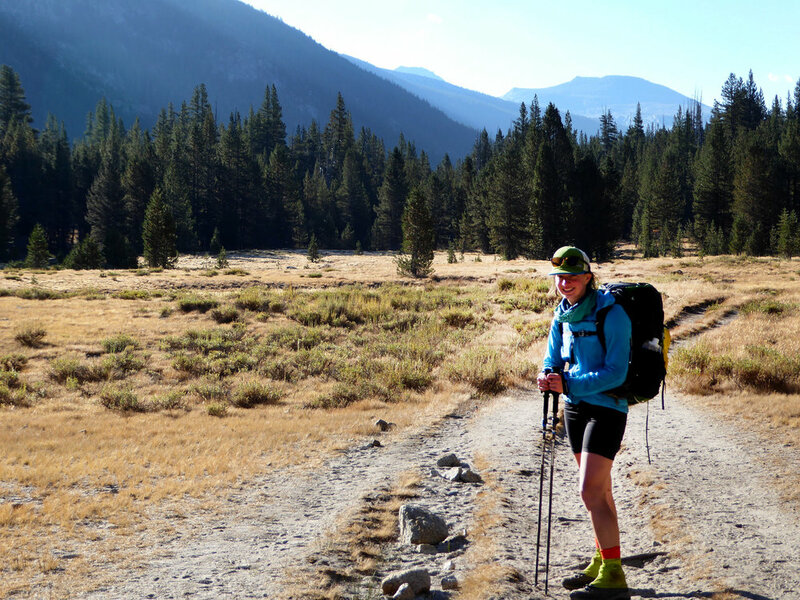 Sarah: The John Muir Trail is a 220 mile long route through the Sierra Nevada of California. Hiking north to south, the trail starts in Yosemite Valley and ends on Mount Whitney with ~48,000 feet of elevation gain along the way. Our JMT hike was the inaugural fundraiser for The Cairn Project, and we set a public goal of completing the trail at the grueling pace of 12 days. I think the biggest challenge for me was letting go of the fear of failing in the public eye - we really put ourselves out there. To be completely honest, prior to this hike I’d only ever backpacked for maybe 5 nights in a row - back when I was an undergrad in college. That being said, we worked really hard to research, plan, and train for the hike. Preparation and planning only go so far with certain aspects of backpacking (blisters, bears, extreme wind). In the end, I was really impressed with the way that we were able to overcome obstacles and truly enjoy our trip. Alison: For me, one of the biggest challenges was just taking the risk of doing something that I had never done before. I had never backpacked for that many days in a row, and certainly not with the type of daily mileage and elevation, day after day, that Sarah and I did. It was something between 4,000 and 6,000 feet of climbing each day, and distance-wise our longest day was about 23 miles. We both planned and trained a ton, but it was a big mental exercise to just forge ahead with the plan, in spite of some amount of “is this totally crazy?” running through my head. And the food regimen got tough - we had to eat our calorie target even though the elevation suppressed our hunger. There are certain ProBars I’ll never, ever eat again except in the most dire of circumstances. Sarah: Two things come to mind as rewards. This was my first trip to the Sierra Nevada, and for me the biggest reward was being able to experience the incredible scenery - beautiful alpine lakes, epic high pass vistas, and starry nights. These places are so special, and spending time in them makes you realize how important it is to protect them. Also, summiting Mount Whitney was a big moment and affirmed our many months of hard work. Alison: So hard to pick one reward! We both accomplished something that was a mental and physical test, and the sense of fulfillment from that is pretty big. The fact that we had all of our supporters backing our effort also made the accomplishment very special. And I’m glad to know that Sarah and I can handle any backpacking scheme we cook up - we’re on the same page as outdoor partners. You hear a lot of stories about people never talking again after trips like this - in fact, I think we witnessed the dissolution of a friendship between a couple of guys we met on the top Forrester Pass. It’s a pretty cool reward to embark on a trip like the JMT and come out the other side with a friendship that was made stronger by the experience. Of the many social enterprise causes that I know you hold near and dear to your hearts, why do you think supporting young girls and access to the outdoors is so critical? What kind of support did you get when you were young? Alison: Young women face so many pressures and challenges, and outdoor activities in a girls-only setting are sort of a “holy grail” for empowerment. I want our next generation of young women to have very best chance possible to achieve everything they are inspired to do. The confidence and self-knowledge you build by pushing your limits in the wilderness are crucial seeds toward that goal. In that sense, The Cairn Project has a really broad focus - it’s about nurturing strong and empowered women. Sarah: I would add to that by saying that outdoor sports and adventure can be really intimidating if you don’t have someone to ‘show you the ropes’ or encourage you like I did. With The Cairn Project, it’s our hope that we can help alleviate these barriers for young women. A great example of this is the sharp decline in the participation of young women in biking during early adolescence. As I’ve gotten more into mountain biking over the years, I’ve had the opportunity to see how female mentorship for adolescent riders can really help young women break into this male-dominated sport. Alison: I was super lucky to grow up in a family that valued outdoor experiences. Both sides of my family were outdoorsy - my mom’s family has some solid Norwegian heritage in the ski and hike department, and my dad was compelled to pass along all of the best parts of his Eagle Scout training to me through hiking, backpacking, and rafting trips. I was especially lucky for these opportunities, because I had asthma and vision issues as a kid and couldn’t play field sports. I did a month-long Outward Bound program when I was 17, and that was a transformational experience for me -- despite my being only one of two girls in my group! My four day wilderness solo tapped into something that definitely has informed a lot of who I am today. Sarah: When I was growing up, my family did a lot of fishing, canoeing, and camping at lakes in the Colorado Rockies. Though these experiences cultivated an appreciation for the outdoors from a young age, it wasn’t until high school that I came to explore the high elevations and unbeaten paths of the mountains in my backyard. At that time, it was a good friend of mine that took me hiking up 14ers and backpacking for the first time – this was the beginning of my lifelong love for adventure. How does your work on The Cairn Project translate to your other work - Alison, you as a lawyer and Sarah, you as a scientist? Alison: The environment and our relationship to it is central to my work. I direct a grantmaking program that supports litigation and activism on behalf of communities facing threats to their environment, outside of the US. In a lot of these communities, human rights and environmental protection are intrinsically intertwined. Despite our comparative privilege here in the States in terms of environmental regulation and other pro-environment policies, I think that our disconnection from landscapes has yielded a lot of harm. So for me, The Cairn Project is partly about helping more young women develop a connection with our landscapes. It’s not just about recreation; having a connection to the land makes for better citizenship and stronger communities. The Cairn Project is also a new and different way to apply my non-profit and grant making experience. Sarah: I’m Currently a USDA-NIFA Fellow and a Postdoctoral Research Associate at the University of Minnesota. The research I do spans native prairie and agroecosystems, exploring the role of land use and global change in structuring soil microbial community composition and function. Outdoors experiences, like those promoted by The Cairn Project, can be important for developing curiosity for the natural sciences. This was true for me and is true for a lot of women that I know in the sciences. To that end, I invest a lot of time mentoring young women who are interested in pursuing careers in science. Where do you want to see The Cairn Project go in the next 5 years? Before we launched, we spent a solid year on brainstorming and prep work: determining the best path to charitable status, designing a brand and website that we felt could grow with the organization, and developing our program and processes. At this point, we’re a volunteer-run organization. The next five years will bring a lot of growth in terms of organizational structure, grantmaking, new strategic partnerships, and the unveiling of some other program concepts we have up our sleeves. Stay tuned! Alison Wright was born and raised in San Francisco, California, but has been fortunate enough to call Colorado, Washington, Mexico City, Costa Rica, and Baja California Sur home. She has spent her career in the public interest sector, much of it in philanthropic grant making. She consults with organizations defending natural resource rights, protecting environmental activists, and amplifying community and indigenous voices for global environmental justice. A lifelong baseball fan, you'll often find her sporting her SF Giants cap out on the trail. Alison holds a J.D. from Seattle University School of Law and a B.A. from the University of Colorado at Boulder. Sarah Castle grew up in a small mountain town west of Denver, Colorado, and has spent most of her adult life a stone’s throw away from the Rocky Mountains. Though she held a fascination for wild places at a young age, it wasn’t until late high school that she became captivated by the high elevations and unbeaten paths of the mountains in her backyard. Merging her love for both exploration and grit, Sarah pursued a career in soil ecology studying the effects of land use and global change plant-microbe interactions. Currently living in Saint Paul, Minnesota, you’re likely to find her either trail running or logging a weekend bike ride. Sarah holds B.A. and M.S. degrees from the University of Colorado and a Ph.D. from the University of Montana.